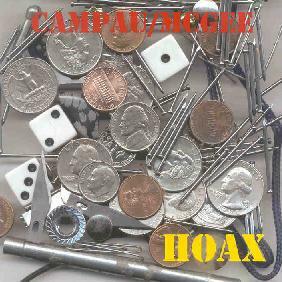 On Hoax, Hal McGee teams up with veteran underground radio disc spinner and musician Don Campau for two lengthy excursions based on the theme of hoax viruses (ultimately harmless and intended only to cause unwarranted panic). "Jdbgmgr.exe" refers to a hoax virus that according to the Symantec site tries to encourage you to delete a legitimate Windows file from your computer. The track is a 31 minute journey that combines electronics, piano, guitar, percussion and probably much more. The piano varies between jazzy and dark intense classical stylings, and the overall work often has a full orchestral feel, though of course it's all happening in a general sound-art atmosphere. The electric guitar provides some tasty rockin acidic and noise bits, as well as a moody intensity, while the acoustic guitar provides more laid back stylings. I like the section around the 25 minute mark where Don is jamming high volume on the guitar while a tinkling piano melody drifts along. A wild combo with Hal's electronics. The electronics throughout provide color, dense backdrops, harsh noise waves and oodles of alien freakiness. I enjoyed the parts where a single electro line would ooh-wee-ooh meander in a near melodic fashion, which sounded pretty cool along with the piano. The aggression level can get pretty high but is relatively restrained and rarely overpowers the underlying "musical" feel. "Forward As An Attachment" begins with piano and percussion free-jazz stylings and some fairly up-front sound patterns. I like the sandpaper texture that provides an interesting contrast to the piano. Don's guitar once again gets mucho rockin and around the 10 minute mark there's a chaotic rock and jazz jam with ethno percussion and electronics that I particularly enjoyed. There are lots of segments throughout this 46 minute piece in which the piano and guitar (both electric and acoustic) jam along while various electronic tones and patterns pop in and out. And as I make my way through the album I think it's the combination of traditional instrumentation and musical styles combined with the sound-art explorations that make this such an interesting listen. It's certainly different from most of Hal's collaborations I've heard to date, though Don can get deep into the experimental sound realm himself. Visit the Lonely Whistle Music web site at: http://lonelywhistle.tripod.com. Visit the Haltapes (Hal McGee) web site at: http://hometown.aol.com/haltapes1/index.html.